We're here again with another MFT Color Challenge! Join us as we create with this powerful color combination. 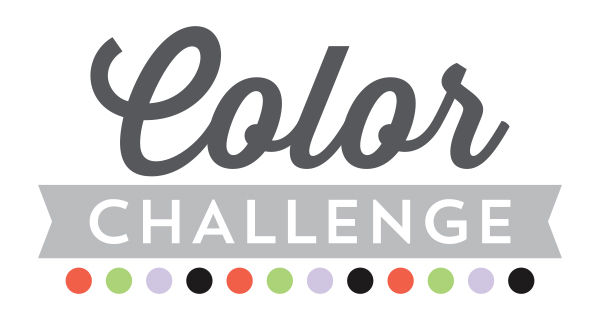 This challenge features rich and dramatic hues to inspire you — Persimmon, Sour Apple, Wild Wisteria, and Black Licorice. 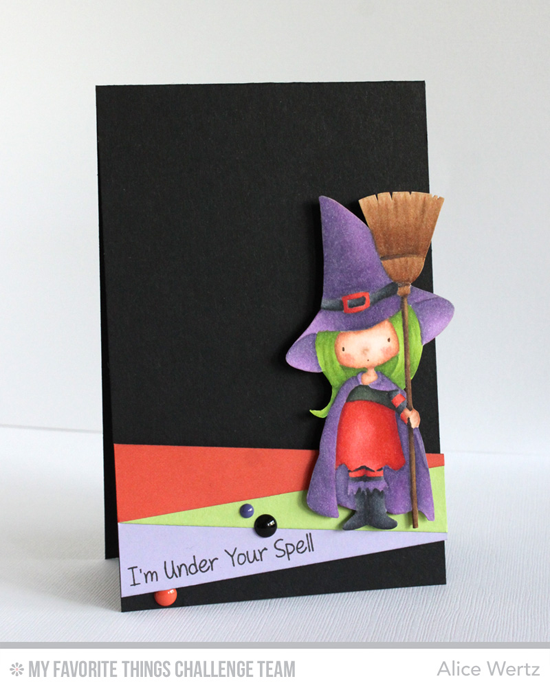 Alice envisioned a Halloween card with this combination, and it's not hard to figure out why! It's the perfect opportunity to play with the Witch Way Is the Candy? stamp set! Erin Lee went all graphic with this bold color combination. 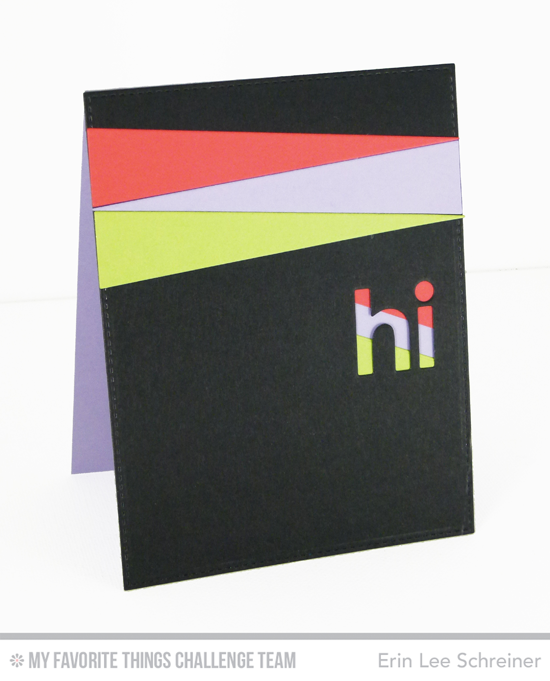 It's amazing the impact four colors and a neutral can have on a simple, yet striking design. 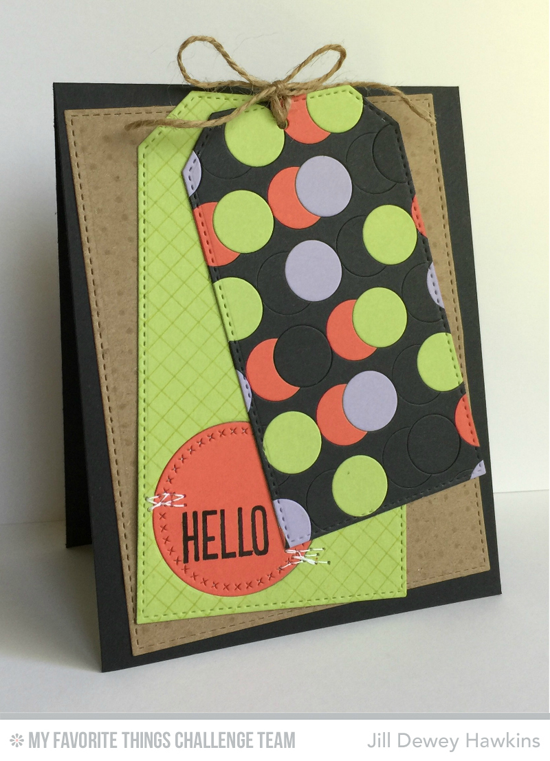 Jill paired the Stitched Traditional Tag STAX and Jumbo Dot Cover-Up Die-namics for this decidedly punchy design. The addition of Kraft lightens up a color combination that could otherwise be rather heavy. Miriam goes retro with the color combination creating a swell background with the rad swoop from Blueprints 25. 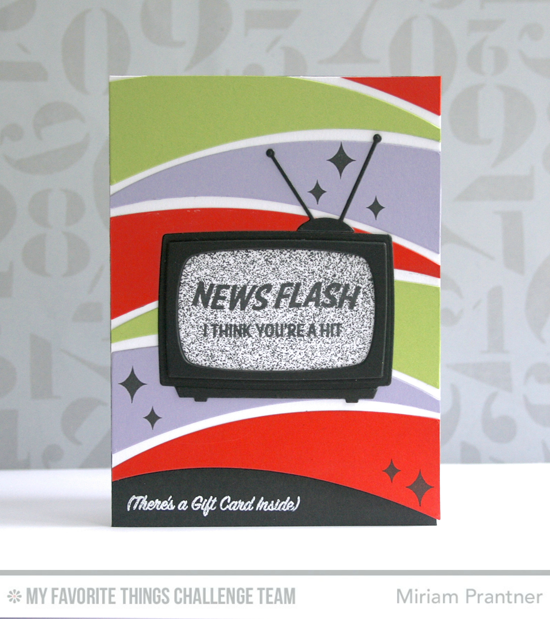 It's a perfect complement to the Television Die-namics and Stay Tuned stamp set! 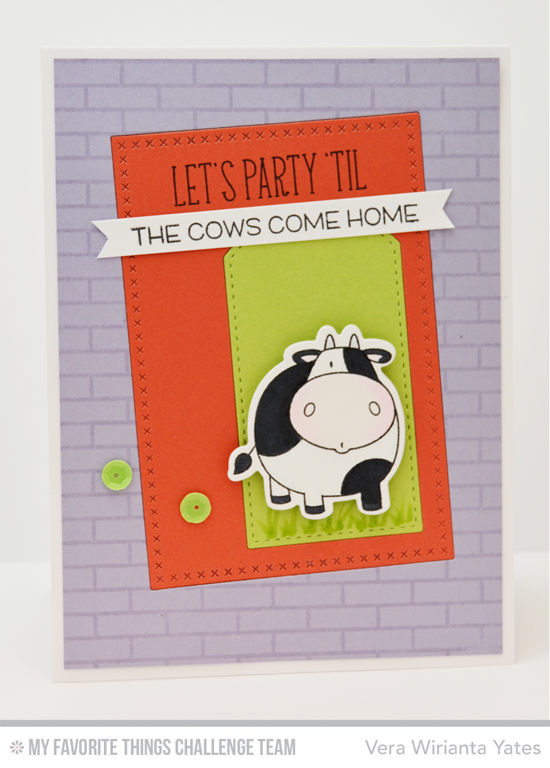 Vera's little party cow from The Whole Herd stamp set looks pretty happy to be resting on a Sour Apple green tag waiting for all of his friends. The Wild Wisteria brick wall makes for an unexpected (and FUN) background. 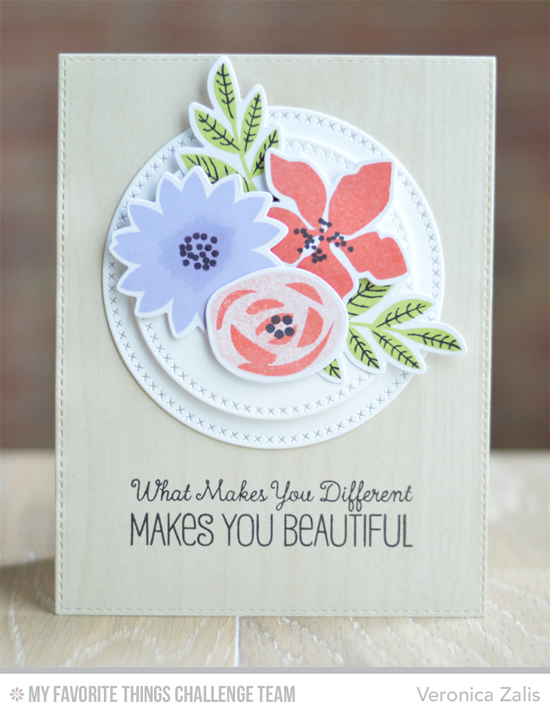 Veronica chose to gather the colors in a delicate bouquet using the Modern Bloom stamp set and Die-namics, and she added only touches of the Black Licorice giving this card a sweet and lovely look. Remember that color combinations can be utilized in small doses with a lighter neutral rather than overwhelming a design. Congratulations, *Vicki*! You are the randomly selected winner of the MFT Color Challenge. You can view all the entries from the last challenge HERE. You have until Wednesday, June 10, at noon EDT to add your link and be eligible for the prize of up to $20 in MFT Cash. Winners are chosen at random, so everyone has a chance! The prize is a $15 Gift Voucher to My Favorite Things, but if you use MFT stamps and/or dies in your project, you’ll receive an extra $5. This post may be the most captive of this team's variety of styles, vision & talents! All brought together by one Creative Ambassador. Just love the fun! :) So cool ladies! WOW! This is awesome!! So happy that I won!! I've already received it and I'm "scheming" up ways to use the certificate!! :) Thanks so much! !